Taipei, Taiwan, Oct 18, 2018—Advantech, a leading supplier of industrial communication solutions, is the pioneer that foresees the growing needs of 90W PoE. 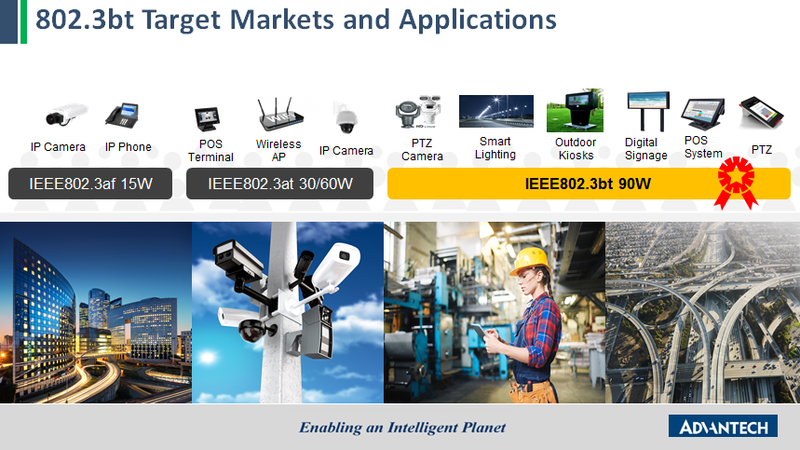 Taking all user scenarios into consideration Advantech proudly launched the IEEE802.3bt compliant 90W PoE Solution. 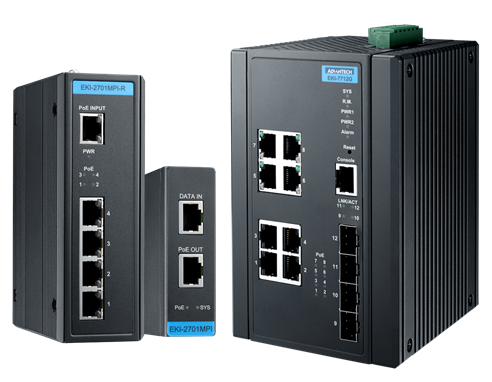 The 90W PoE family includes an industrial Ethernet switch EKI-7712G-4FMPI, injector EKI-2701MPI and extender EKI-2701MPI-R. The EKI-7712G-4FMPI is an IEEE 802.3bt Class 8 90W PoE switch for high-power-demand applications. It is ready for current 15W or 30W PoE mainstream applications with six 802.3 af/at PoE Gigabit ports, and is also with additional four SFP ports for long distance data transmission. Other than that, the EKI-7712G-4GMPI is a future-proof Ethernet switch that fulfills your 90W PoE needs when the day comes with its two IEEE802.3 bt PoE Gigabit ports. Still, the EKI-7712G-4FMPI is embedded with Advantech’s Security Pack that guarantees users a safe network environment. The EKI-2701MPI is a slim size IEEE802.3bt Gigabit 90W PoE industrial grade midspan/injector that enables 802.3bt solution on existent Ethernet network, allowing for a painless introduction of 802.3bt solutions without mass upgrading the Ethernet backbone or rewiring tasks. The EKI-2701MPI is using 4 twisted pairs cable for higher power and data transmission capability, boosting the power budget of each port up to 90W over Ethernet cable. Advantech also launched the Gigabit extender EKI-2701MPI-R. It features in the ability of receiving 90W power from IEEE802.3bt compliant PSE devices from the line, and can offer standard 802.3af/at power source with four Ethernet ports serving up to power budget 60W. With EKI-2701MPI-R, users can easily extend the network and power coverage without PoE standard boundary.